As a safety community, let’s all bring awareness to Locator Safety Awareness Week, as we take the opportunity to address the need to keep all locators safe on the job. Locator Safety Awareness Week (LSAW) provides an opportunity for the industry to thank our boots-on-the-ground heroes and let them know their contributions to safe worksites and communities are appreciated and valued. 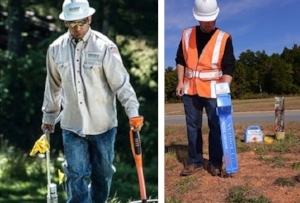 Companies of any size, in any industry, can participate in Locator Safety Awareness Week. We have put together a great list of ideas of how your team, your organization, your safety department or your company can promote the hazards related to utility locating. Take the opportunity during this week to acknowledge the locators you work with or see working in your area and let them know how much you appreciate the difficult, challenging, and sometimes dangerous work they do protecting our underground utilities. Promote Locator Safety Awareness Week on Social Media by using the hashtag #LSAW. Need some help with what to say? Feel free to use the messages provided in the LSAW Social Media Toolkit. Post a Locator Safety poster in a prominent location in your building or warehouse. Download a FREE printable 11 x 17 poster in English or Spanish. Include an article about Locator Safety Awareness Week in your company newsletter. Send safety awareness cards to locators in your organization or locators that you know. Host a safety meeting or toolbox talk on trenching and excavation safety. Promote Locator Safety Awareness Week on your website with colorful web buttons. Make plans to attend the next CGA Excavation Safety Conference and Expo. Join the bigger conversation and support April as National Safe Digging Month. 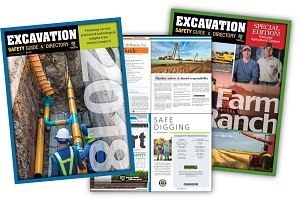 To take your excavation safety awareness to the next level, check out the Excavation Safety Guide & Directory. This guide is the industry’s best source for articles on safe digging, written by industry professionals. In the field, the guide offers immediate access to a directory of helpful resources and information on safe excavation practices. Put useful and life-saving information in the hands of those who are involved in the excavation process at your next meeting or event. Make sure the ground disturbers you work with are getting your message. Personalize the Excavation Safety Guide with state and local laws, meeting and event schedules or other important information you need to share. Did you know? Digging without knowing the approximate location of underground utilities can result in damage to gas, electric, communications, water and sewer lines, which can lead to service disruptions, serious injuries and costly repairs. 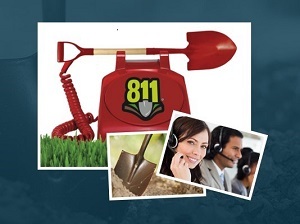 When you call 811, you reduce the chance of causing damage to less than 1%. 45% of American homeowners who plan to dig will NOT call 811 beforehand, putting themselves and their communities at risk. There are more than 20 million miles of underground utilities in the United States. That means there is more than one football field’s length of buried utilities for every man, woman and child. Awareness campaigns, like Locator Safety Awareness Week, offer a great opportunity to safety management, business owners and management to highlight the importance and commitment the organization has to worker safety. It doesn’t take a lot of time, money or resources to participate. At minimum, consider an email from management to the staff, a brief safety meeting or a sign on the central bulletin board.